Sometime we take things for granted. How many of us gives extra care for our feet? How important is your feet to you? Maybe not now but you will know why when you hit 40 years and above. I know that skincare, haircare, bodycare, healthcare are important but does anyone of us actually care about our feet until it’s too late. As you know recently, I started to wear Dr.Kong’s shoes from MyORTHO Care I am able to walk the extra miles without feeling cramp, blister or pain; especially during my trips. MyORTHO Care just opened it’s new outlet at the Mediplex in Subang Jaya Medical Centre (SJMC) this week. 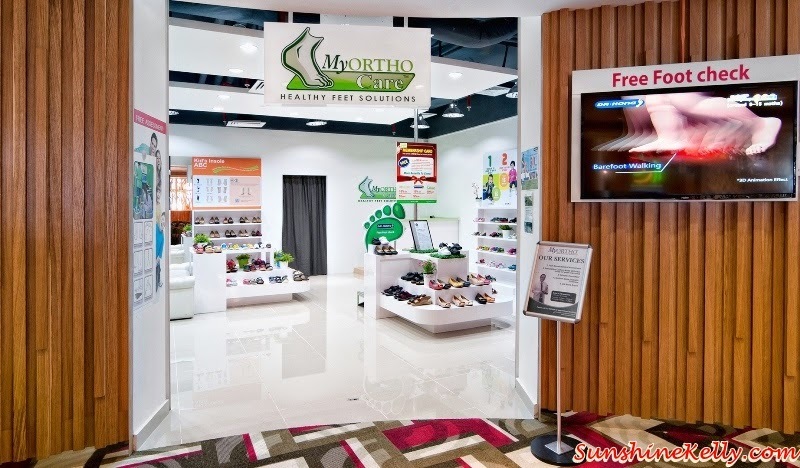 Well, MyORTHO Care @ SJMC is a comprehensive footcare, pedorthics services and also an orthotic center to accommodate those with mild to severe foot condition and offers basic assessment to custom feet insole prescription, orthopedic shoes and sandals from Dr. Kong, Schein and Aetrex. At MyORTHO Care the emphasis is placed custom orthotics that are designed to align the foot and ankle into the most anatomically efficient position. They may look like regular insoles, but are biomechanical medical appliances that are made to correct specific foot imbalance. The benefits of custom orthotics - they helps to reduce stress and strain on our body by bringing our feet back into proper alignment. To maintain this alignment, Dato’ Dr Edmund Lee suggested to paired it with Dr Kong shoes as they have firm heel counters to stabilize the heel bones. Dr Kong provides healthy shoes and foot care products for babies, children, and the elderly so that everyone can wear them comfortably. The common foot complaints are hammertoes, blisters, bunions, corns and calluses, heel spurs, claw and mallet toes and athlete’s foot that can develop due to neglect, ill-fitting shoes and wear and tear. Flat feet are also very common and occur when the arches beneath our feet do not develop during childhood. In other cases, flat feet may also result after an injury. It can contribute to problems in your ankles and knees by altering the optimal alignment of your legs. Jalan SS12/1A, 47500 Subang Jaya, Selangor, Malaysia. Comfortable shoes with sensible heel height are the best option for your feet. Luckily, there are a lot of stylish options to choose from these days.You can choose your best walking shoes by visiting our site. Orthopedic shoes have frequently been viewed as an ugly alternative of footwear for individuals with medicinal conditions that influence their legs and feet. In spite of the fact that the shoes may not be alluring, they have an imperative part to play in the advancement of the patient's legs. The Orthopedic Walking Shoes are amazingly useful for individuals who experience the ill effects of endless foot, and leg torment. Thanks for these great orthotics. Our feet deserve only the best and those who suffer any foot condition shouldn't give up on walking or running. Instead, there are great sneakers that can help your feet. The best running shoes for plantar fasciitis and the best running shoes for flat feet are two lists that contain the best products you can find in the market today. Thanks for sharing these innovative orthotics. Women usually sacrifice function for fashion, but these shoes are great for keeping our feet fashionable at the same time comfortable. In fact, most shoes on the market will make your foot pain worse. So picking the perfect shoes is essential to avoid foot injuries, ankle pains, and Plantar Fasciitis. Last month June 2018, I bought two pairs of shoes from here. It is comfortable but it scratches my ankle at the back of the shoes. I only wear it yesterday and both of my legs are bruise with the scratches. Why this problem occur and how can I prevent it before I use this to travel soon? Please advise. Thanks. I bought two pairs of shoes at the Mediplex, Subang Jaya from MyOrtho. It was comfortable and after walking a about half hours yesterday and the back of the shoes scratches my ankle until bruise and skin at the ankle is bleeding. Please let me know what is the problem and how can I prevent this from happening before I use to travel soon. I do not want to get myself hurt when I am in overseas. Let me know what should I do. When I try it on before I buy, it was comfortable until walk for awhile and the scratches makes it unbearable. Please help as I spend a lot buy two pairs. Written many times but no response. I bought two pairs shoes. After wearing it, the back of the shoes scratches my ankles until bleeding. How can I prevent this from happening? Please response.